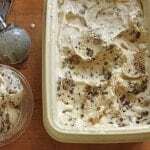 If you make homemade ice cream, use it in this recipe! Prepare the Cookie Dough: In a small bowl, whisk together ground flax and hot water. Set aside. In medium bowl, whisk together white rice flour, sorghum flour,baking soda, and salt. In bowl of stand mixer fitted with paddle attachment (or large bowl), cream together shortening and sugars on medium high speed. Cream until a thick paste forms, about 30 seconds. Add flax mixture and vanilla. Cream until mixture is light and fluffy, about 45 seconds. Drop dough, about 1/2 teaspoons each, onto prepared baking sheet. Cover pan with plastic wrap and chill until dough balls are firm, about one hour. After all ice cream has been transferred, smooth ice cream with the back of a spoon. Press a piece of plastic wrap directly onto the surface of the ice cream. Cover container with a tight fitting lid. Freeze until firm and serve.